In retrospect it was probably not very smart to spend both Christmas Eve and Christmas laboring in the kitchen to create multi-dish meals. But the results were so good for both, I can’t really fault myself, and I did have two more weekend days to recover. For Christmas I decided to cook from The Martha Stewart Living Christmas Cookbook. I’ve used this book before, though not for much: a guide to making pot pie, possibly a coffee cake. A number of the desserts repeat recipes in other MSL cookbooks, though since they’re good recipes it’s probably better to have several copies than to be without them. 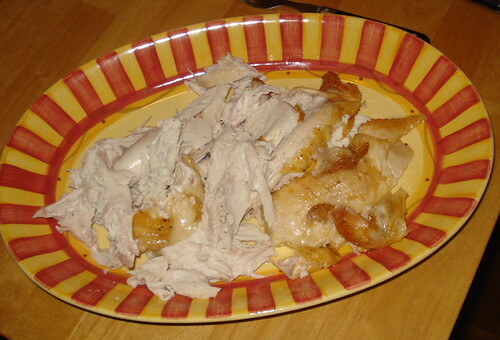 I had never made a Christmas dinner from it, despite the obvious possibilities. So I went through it, selected some recipes, double-checked oven temperatures and timing, and replaced some recipes with others that would make for a smoother cooking day. I made a cooking plan. I looked at our side table, laden with little bags of cookies and candy, and decided not to make a separate dessert. I invited a friend to join us for the big day. 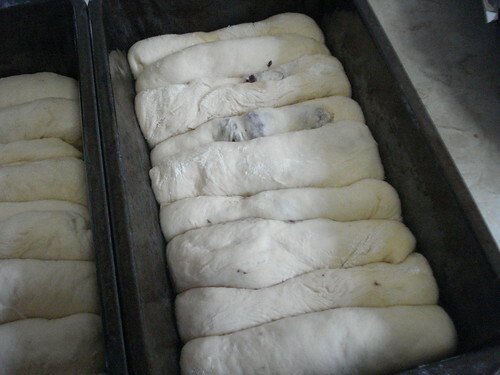 The first thing I started working on was the olive-filled rolls, specifically the sponge for the bread. 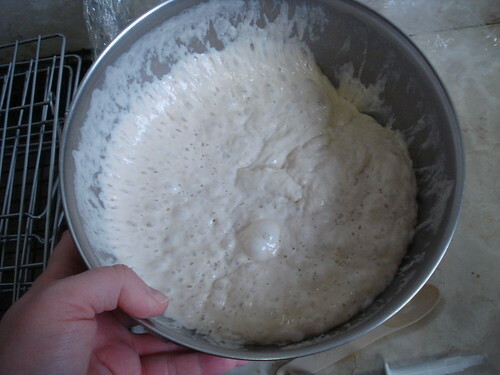 I mixed a fairly small amount of yeast with warm water and let it sit about 10 minutes, until it bubbled a bit; then I added more water plus some oil and flour and mixed it all together with the dough-hook attachments for my hand mixer, transferred the mixture to an oiled bowl, covered it with plastic wrap, and let it sit at room temperature for 24 hours. 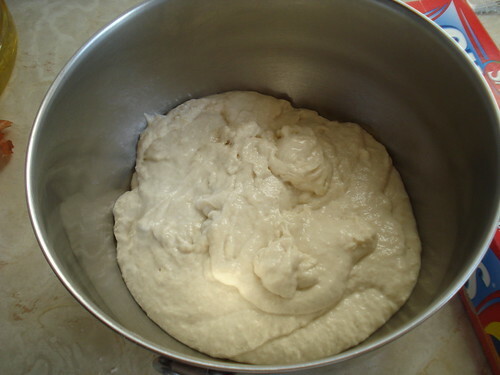 The mixture was thick but soft when I put on the plastic wrap; it expanded during the incubation period, though it never overflowed the bowl as I feared it might. When I removed the plastic wrap the next morning it was a thick and springy mass. 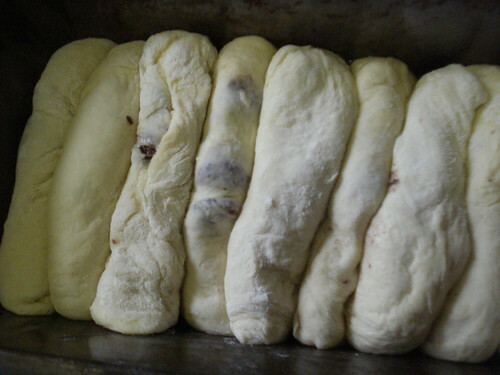 The recipe directed me to add half a cup of sponge “pulled into small pieces” to the olive roll mixture, but I would have had to lay the individual pieces out separately on the counter to keep them from melding back together at once. The half-cup mass blended easily enough into a mixture of water, a bit more yeast, olive oil, flour and salt, and the dough hooks on the mixture did a quick and efficient job of transforming the ingredients into a unified and springy ball of dough. 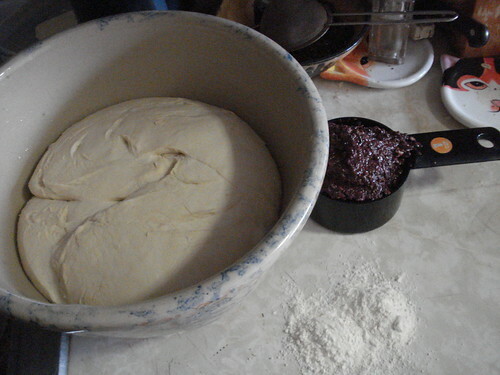 I had never used the hooks for bread before; I prefer to knead by hand. But at this point I knew I would need the 20 minutes or so that using the mixer would buy me. 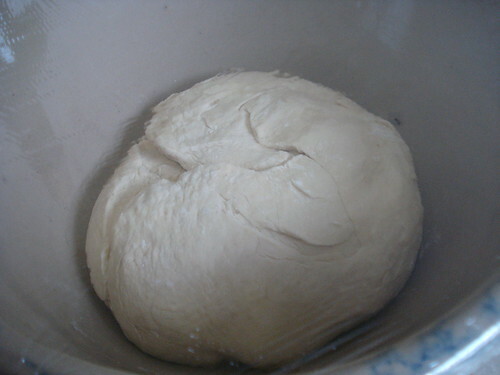 I did spend about five minutes doing a final hand-knead, then put the dough into an oiled bowl and let it rise for two and a half hours. I put the remaining sponge into the fridge; I should really freeze some of it. It will be handy for making more bread (I think if I follow one more of the recipes calling for sponge that Martha includes, I’ll figure out what I need to know to improvise afterward). While the dough rose I began my vegetable prep. 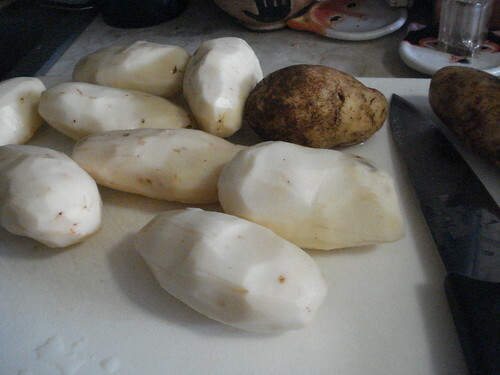 On paper this did not look considerable, as I had only four vegetables to prep: potatoes for boiling and mashing, shallots for roasting, parsnips for roasting, and brussels sprouts. 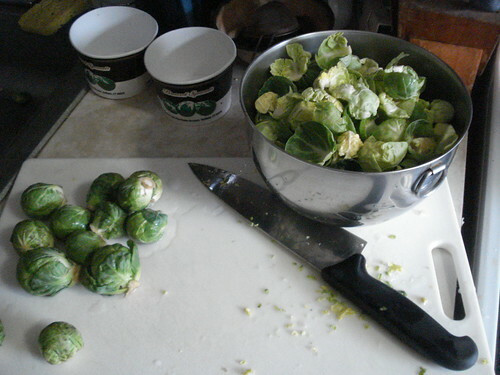 Unfortunately, the brussels sprout salad recipe requires you to separate the sprouts into individual leaves, which sounds reasonable enough until you actually start to do it. Brussels sprouts are really miniature cabbages, and those tiny little leaves take a bit of gentle persuasion to separate. I soon developed a system: cut off the stem end and pull away the loosest leaves, cut off a bit more of the stem end, continue until the little core of sprout remaining was no bigger around than my little finger, leave it at that. 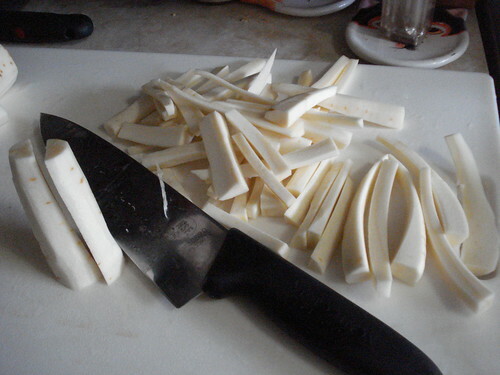 This was tedious work, but it made for a pretty salad, and it made the peeling and slicing of potatoes seem like a snap in comparison. Once the leaves are separated, the salad is simple: blanch the leaves in boiling salted water 1-2 minutes, then plunge them into an ice bath to stop the cooking and fix the bright color, then drain. This part moves fast, so I couldn’t really get any good pictures of it. 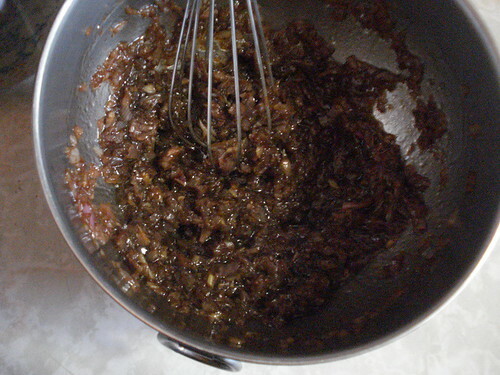 For the dressing, I roasted the shallots whole, then peeled them and put them into a food processor with some balsamic vinegar and pulsed to chop them. I transferred this mixture to a bowl and whisked in some olive oil, then dressed the sprout leaves with the vinaigrette when it was time to serve dinner. 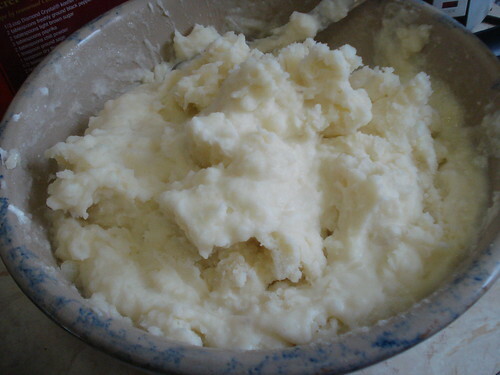 Mashed potatoes are as straightforward as you might expect: peel and slice potatoes, boil them until tender, then mash them together with milk, butter, and sour cream. 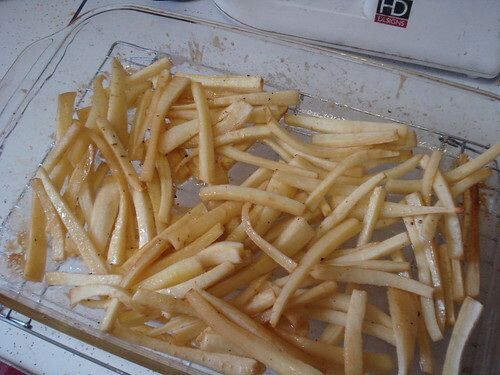 The clever part is to then serve them with caramelized parsnips: parsnip sticks that have been roasted with olive oil, sugars, garlic powder, salt and pepper. The flavors go wonderfully together. 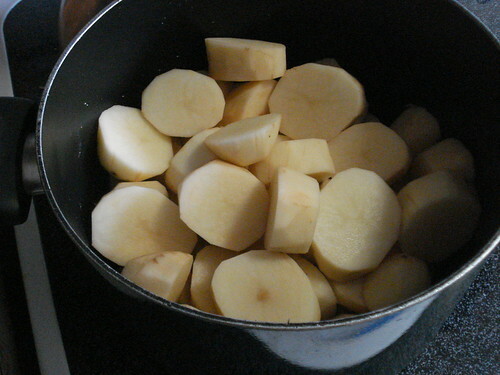 The other clever part is to use the dough hook attachments to mash the potatoes, which quickly blend and mash them without overbeating or making them gluey or tough. Who knew? Roasted turkey breast was pretty simple too: brush a turkey breast with olive oil and season with salt and pepper, roast it until done. I had to let the turkey breast finish early so I could raise the oven temperature to bake the rolls; when they came out, I put the turkey back in to make sure it was warm, but while it was resting I poured the pan drippings into a saucepan to make gravy. I had never really made pan gravy before. 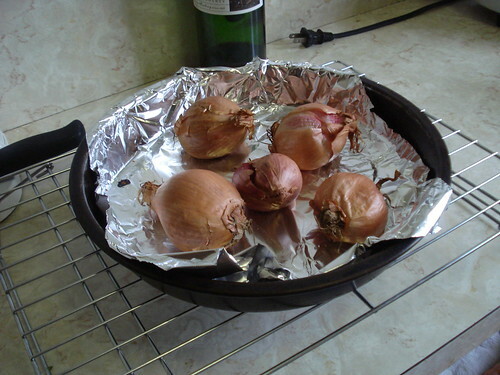 The recipes I’ve seen always tell you to put the roasting pan on the stovetop, and I’ve never had a roasting pan that was suitable for putting on a burner. But during the roll-baking hiatus it occurred to me that since the turkey was fully cooked I could put it on the platter while I poured off the pan juices, and that it was certainly worth a try. And gravy turns out to be simple. Heat the pan juices in a skillet or saucepan; stir in some flour to make a roux (one could use cornstarch or arrowroot too), then add water or broth gradually while continuing to whisk, until the gravy reaches the desired consistency. Ah, the rolls. These were probably the most complicated recipe of the day. 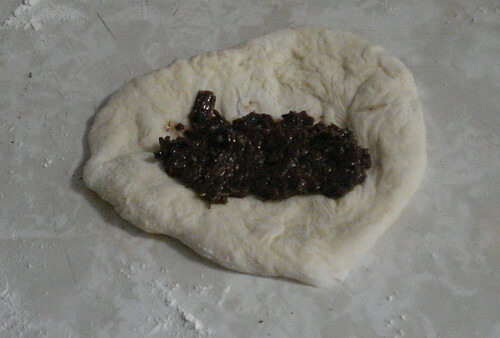 Once the dough had risen I divided it into 18 more-or-less equal pieces. I used my fingers to press and stretch each piece into about a rectangle about 4 by 5 inches, and spooned on a bit of olive paste (made by combining kalamata olives, balsamic vinegar, olive oil and garlic in the food processor). I rolled up each piece so the olive paste was sealed inside; I think the filling was supposed to spiral with the dough like a cinnamon roll, but most of them weren’t large enough for the spiral effect to be really evident. I laid the rolls together in loaf pans, nine to a pan, and let them rise once more. When it was time to preheat the oven I put an empty metal baking pan on the bottom shelf, and when I put the rolls in I poured water into the pan so it would create steam in the oven. This gave the rolls a¬† nice crusty exterior. When they were done baking, I pulled the pans from the oven, turned the segmented loaves out onto a cooling rack, and let them rest while I reheated and sliced the turkey breast and got everything else ready. This was a lovely holiday meal. 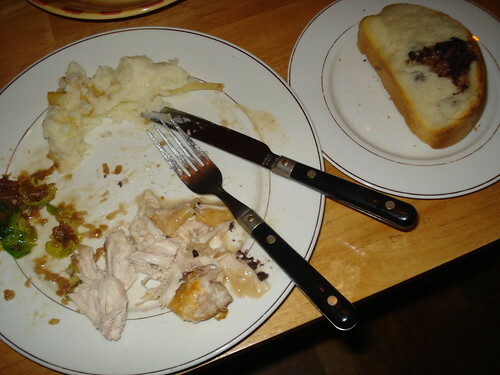 The turkey was juicy and delicious; the salad was tangy; the potatoes were rich and luxurious; and the rolls. The rolls! 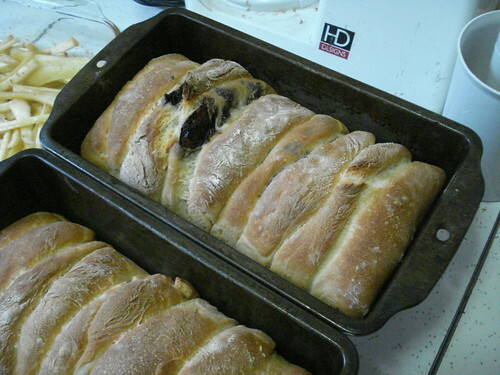 They were wonderful, the rich olive mixture playing off the tender bread. 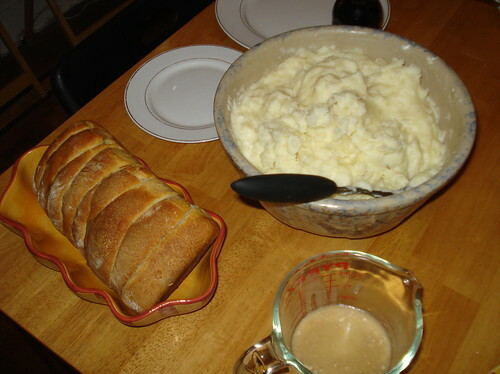 Even the gravy was a nice complement to both the meat and the potatoes. Our friend brought more sweets, and we had a nicely indulgent Christmas dinner. Oh, and I used the leftovers too: On Sunday I made pie crust (also from this cookbook, as it happens), sauteed onions with celery, carrots, mushrooms and potatoes, added chunked-up turkey breast, and made a bit more gravy; I assembled all these into mini pot pies shaped in muffin pans. 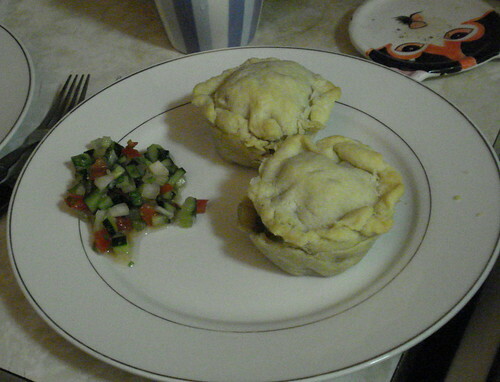 They turned out well, and I managed to get all but two of the little pies out of the pan without breaking them. Verdict: Success. I’m going to have to make the rolls again, and soon. 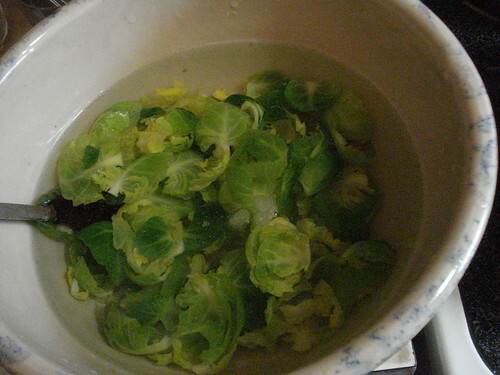 In the future I might just quarter and blanch the brussels sprouts, though it wouldn’t be as picturesque. Posted in: 107 Cookbooks, Comprehensive Cookbooks, Entertaining.